May turned out to be a pretty eventful month for me, astronomically-speaking. As noted in my oath-breaking last post, I bought one of the Sky-Watcher scopes that is on crazy sale at Amazon right now. I got the 130N-EQ2, a Newtonian reflector on an equatorial mount. I’m not a big fan of EQ mounts. Yeah, they let you track the sky by moving the scope slowly on one axis instead of two, but for that convenience you get to pay quite a bit more than you would for an alt-az mount (normally, that is; right now at Amazon you get the whole kit-n-kaboodle for about what the eyepieces regularly cost), and you get to lug around a lot more weight, too. YMMV, but I like to lug optics, not machinery, and I don’t mind nudging the scope every couple of minutes. 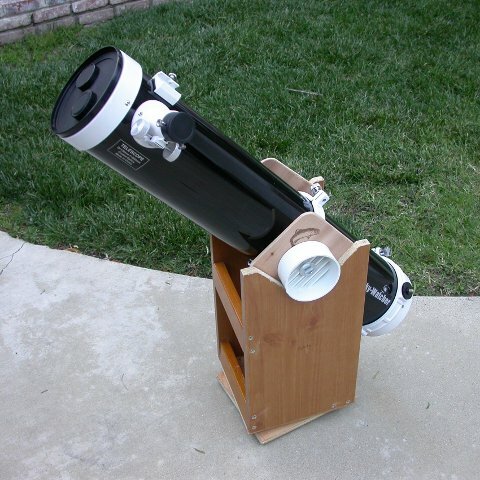 So I sold the EQ mount on the Cloudy Nights classifieds (bringing the net cost of the scope down to a ridiculous $40) and used some scrap wood from the garage to build a Dobsonian mount. That project is still ongoing; it’s about halfway painted right now. More construction details soon. 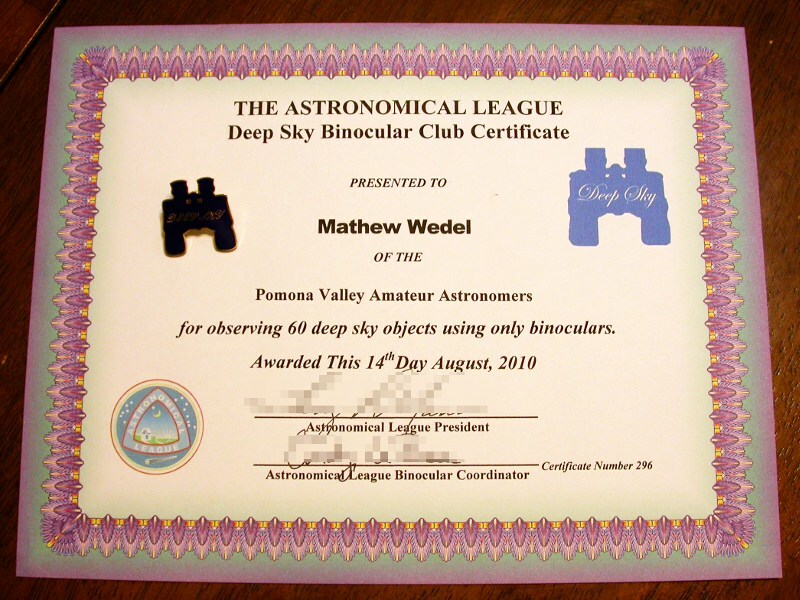 Back in April, I started writing a series of articles on the world’s largest telescopes for Nightwatch, the newsletter of the Pomona Valley Amateur Astronomers, and the first one came out in the May newsletter (that link will be good for about three months, after which you’ll be able to find the article on the Nightwatch archive page). What does June hold? Well, on the 12th the PVAA is going back to Mount Wilson. I’m keeping my fingers crossed for that–last year they got clouded out in June and had to reschedule for the fall (which worked out well for me). Venus, Mars, and Saturn are all well-placed right after dark, and Jupiter is up before dawn. There’s a minor comet to chase if you’ve got optics and reasonably dark skies. 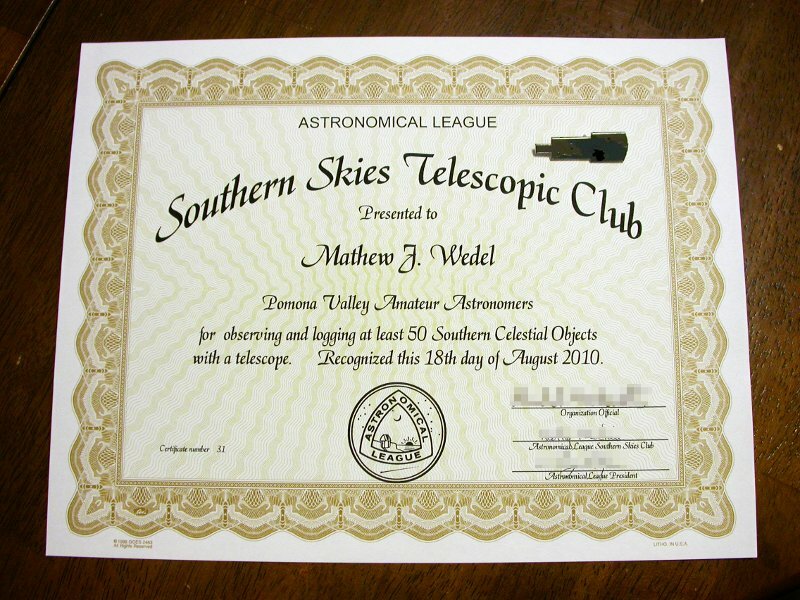 And I’m about 10 objects away from finishing my observations for the AL Deep Sky Binocular Club. So, lots to do and see. My posting will probably be hit-and-miss this month also; I’m going on vacation for the next week and when I get back, I have to knuckle under and get to work on some lectures. If you need ways to entertain yourself, the advice given here still holds. Clear skies! My parents got me Harvard Pennington’s The Year-Round Messier Marathon Field Guide this past Christmas, and I have been obsessed with Messier Marathons ever since. I’d never run one; before last night I’d seen fewer than half of the Messier objects (54/110). Pennington subverts a lot of conventional wisdom in the book. Before reading the book, I figured I might attempt a marathon some day after I’d seen all the Messiers and knew my way around the sky a little better. Pennington argues forcefully that running a marathon is the best way to learn the sky, build observing skills, and build confidence. In other words, it’s not something you have to work up to, it’s the way you work up to a good working knowledge of the sky. Some people go Marathoning only in March…. That is silly. The very next dark of the moon is the best time for you to run your first Messier Marathon. One of my local clubs, the Pomona Valley Amateur Astronomers, was heading to Death Valley for a big star party this weekend. For various reasons, I was looking for something a little closer to home. Last month the PVAA star party was down at the Salton Sea, but we got clouded out after just a couple of hours. I knew that fellow PVAA member Ken Crowder was also looking for a closer spot and thinking of returning to the Salton Sea, and we planned to meet there yesterday evening. Ken was going primarily for astrophotography, and I was going to attempt a Messier Marathon. Pennington’s Field Guide was my inspiration and how-to guide. I also wanted an all-sky map showing all of the Messiers that I could use as a roadmap. I found this one on WikiMedia Commons and printed out a color copy on 11×17 paper. * Finally, I used Stellarium to figure out where the horizon would be at sunset and sunrise, to determine which Messiers would be easy, which ones tricky at dusk and dawn, and which ones impossible. I used a black marker to draw the horizon lines on my all-sky printout, and used the marked-up map to figure out a search sequence. In this I departed a bit from the Field Guide, which has built-in search sequences for every month of the year. 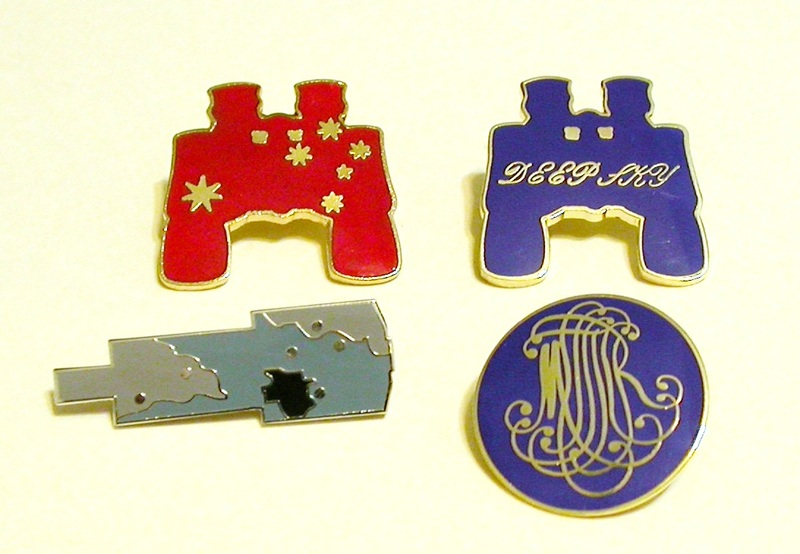 These are good and helpful, but in places counterintuitive. Search sequences are critical for catching those objects that are only visible in short windows at dawn and dusk. For the rest of the night, it makes sense to work from west to east in strips and from south to north within a strip (because more southerly objects set sooner than northerly objects at the same right ascension, or sky “longitude”), but the exact order is less important. My decision to depart from the Field Guide sequence was not without consequence. For the twilight rush, I wanted to start with M39, an open cluster near the bright star Deneb in Cygnus. It was the lowest Messier object in the sky at sunset, and thus the hardest to pick out of the twilight glow before it set. I wasn’t too worried about getting M39, because it’s fairly far north and would rise again a couple of hours before dawn. Still, it would be nice to get off to a strong start by picking it up the first time. After M39, the twilight rush was full of galaxies: M74, M77, the Andromeda galaxy (M31) and its bright satellite galaxies M32 and M110, and fellow Local Group member M33. I was worried about these because galaxies are notoriously difficult in bright skies, and I’d never seen half of them, including the crucial M74 and M77. At the other end of the night, I was anxious to see how many of the clusters and nebulae I’d be able to fish out of the sky around Sagittarius. This was a special concern because the area around Sagittarius and Ophiuchus holds the densest concentration of Messier objects in the sky–almost a third of the Messiers, in a patch of sky about as big as two outstretched hands. On top of that, they’d be rising just before sunrise. At best, I’d go into the Sagittarius region with 70-odd objects logged; the outcome of the marathon would largely depend on how well I fared that area, at the end of an all-night observing session, racing against the sunrise. I knew from Stellarium that at least four objects were flatly impossible, because they would never be above the horizon without the sun: M72, M73, M30, and M2. Three more were pretty iffy; M55, M75, and M15 would be flirting with the horizon but deep in the morning twilight. A final three I felt pretty good about; M54, M69, and M70 are at the bottom of the Sagittarius “teapot” and I thought they’d be tough but doable. All told I figured the maximum possible outcome would be 100 objects definitely, 103 probably, and 106 at the very outside. I got down to the Salton Sea just before sunset and found Ken set up in a parking lot near the campground. I set out my 6-inch Dob and 15×70 binoculars. I’m working on the Astronomical League’s Messier and Binocular Messier observing programs, and I wanted to bag as many Messiers as possible with both instruments (please be aware that the AL does not accept marathon observations for the Messier Club; nevertheless, running a marathon is still good practice and makes finishing the AL observations easier). I also brought a folding chair for seated observing at the scope, a tray table for maps and charts, a camp chair for visitors (which ended up holding the binoculars between looks), and a tripod for the binoculars. Normally I prefer to use the binoculars freehand, and in fact that is how I used them for most of the night, but when searching for tough stuff in the twilight it’s nice to be able to point them in one place and have them stay. I also brought along the basic creature comforts: warm clothing, snacks, and plenty to drink, both water to stay hydrated and energy drinks to stay awake. The evening rush turned out to be surprisingly easy. M39 was an easy catch in both binos and scope. I couldn’t get M74 in the binos but it was fairly easy in the scope with averted vision. On the flip side, M33–a big, dim, face-on spiral galaxy–was easy prey for the binos and I didn’t try for it with the scope. In retrospect, I think I should have at least tried, but at the time I didn’t want to take any time out of the evening rush for such a notoriously tough catch. Soon I settled into a rhythm. I used the all-sky map to figure out what to hit next and the Pocket Sky Atlas to figure out how to get there. ** I tended to seek isolated targets with the binoculars first and then the scope. For objects in clusters or chains, I needed to be able to leave an instrument on a landmark I could get back to, so I worked out the star-hops with the scope and then chased them up in the binos. Heading into the marathon, I was sweating the Virgo-Coma Cluster more than Sagittarius, for two reasons. I’d been through most of Sagittarius before, and it’s almost all globular clusters, which are usually easy. Virgo and Coma only have about half as many Messiers as the Sagittarius/Ophiuchus area, but they’re ALL galaxies, very tightly packed and with few bright stars for finding one’s way. Both the Field Guide and the Pocket Sky Atlas have special charts just for the Virgo-Coma “clutter”. It turned out to be surprisingly nonproblematic. Perhaps it’s because I’ve been doing so many star-hops with binoculars from my driveway, but under the reasonably dark skies at the Salton Sea I found enough stars to guide me through the clutter. It wasn’t fast or fun–including 15 minutes off for a snack and a bathroom break, it took me almost an hour and a half to track down the 16 galaxies in that part of the sky–but I got them all. And all but one with the binoculars, after having found my path with the scope. In any Messier Marathon in or around March, there is a spot after the Virgo-Coma Cluster when you’ve seen everything that’s above the horizon, and you might as well knock off for an hour or two while you wait for Ophiuchus and Sagittarius to crawl over the eastern horizon. In the quarter hour leading up to 2:00 AM I fished M12, M10, and M107 out of the dense atmosphere near the horizon, and then decided to call it for a while. I packed everything up and crawled into the car for a nap. I couldn’t sleep until I had double-checked that I was on track, so I pulled out the all-sky map and started checking off targets based on my log. I had 73 down, but try as I might I could not find more than 36 unseen targets on the map. Somewhere I had missed something. And I had a nagging feeling that the one I had missed was one of Messier’s “mistakes”–a multiple star rather than a cluster. Fortunately, the Field Guide breaks down all of the Messiers by type and includes a special section on these. And there it was, M40, a double star in Ursa Major. I had completely missed it while sweeping up the Great Bear’s galaxies in the early evening. Fortunately it would be high in the sky for the rest of the night so I’d get another shot, but it illustrates the risk of not sticking to a strict, written observing program (M40 was on my map, I’d just cruised right past it). Sorting that out took the better part of an hour. I planned to get back at it at 4:00. I set my alarm, closed my eyes, and…failed to sleep. Too keyed up, too anxious about Sagittarius. But I did rest. I got a bit of a late start. After rousing at 4:00, taking a biology break, and re-setting up all of my gear, I didn’t cross off M40 until 4:22. Then I knocked out M57, M56, M29, M27, and M71 in the area around Lyra and Cygnus–the last five objects outside of the Sagittarius snarl. I was back in the groove and went into Ophiuchus and Sagittarius crossing off an object every three minutes. Having never seen a sunrise at the Salton Sea–and having seen only a couple of sunrises from any observing field–I had tried to guesstimate how late I could go from Stellarium. I knew the sun would come up at 6:40 AM, and I figured I could push through to about 6:00. Imagine my distress when at 5:20 I saw the sky getting bright in the east. I trucked on through the “steam” rising from the Sagittarius teapot, but I was getting desperate. Shooting up to Scutum and the “tail” of Aquila, the Eagle, I could not find M26 in the brightening sky. My final object was M11, the Wild Duck Cluster, which was an easy catch in binoculars at 5:38. I wanted to get it in the scope, too, but with so few stars showing in the sky I couldn’t figure out how to get there. I finally had to start at the other end of the Eagle, with Altair, and hop down the bright stars of the backbone. I got to the right spot, and couldn’t see a thing in the low power eyepiece. I had to boost the magnification to 120x to darken the sky sufficiently to pick up the dim outlines of the cluster, finally bagging it at 5:44. And that was it. I am pretty certain now that M55, M75, and M15 were too far down to be possible. I still think that M54, M69, and M70 might have been possible at the base of the teapot, but by the time I got to them they were history. I missed M26 and later realized that I’d passed by M23 in my Sagittarius blitz. I ended the night with 98 objects. I got M74, M109, and M98 in the scope only, M33 in the binoculars only, and the other 94 with both instruments. I also wrote down a one-line description of each object. As stated above, marathon observations don’t count for the Messier Club, but it was still useful to scribble down a brief description. It will make re-observing the objects easier and more interesting, since I’ll be able to compare my thoughts from a more leisurely look to my brief impressions on marathon night. And it is nice to have a physical memento of the night; I’ve reread my notes a couple of times already and have a feeling that I’ll return to them a lot in the future. On one hand, I am frustrated that I ran out of time. M23 and M26 should have been easy prey–they were way up in the sky compared to some of the other home-stretch targets–I just never got to them. A rookie mistake, fairly small in the big scheme of things, but it kept me from that magical three-digit number. On the other hand, 98 objects is still a great score for my first marathon, especially an “off season” marathon in which fewer than 110 objects were possible to begin with. It was a huge confidence builder and a heck of a lot of fun. I learned a ton about what works and what to avoid. And I’ll definitely be back for more. * The printable version of this chart is now on the “Messier Marathon tools” page on the sidebar, along with a streamlined checklist for marathon night and other goodies. ** It occurred to me after I wrote this that it might sound a little odd. On one hand, I have been singing the praises of the Year-Round Messier Marathon Field Guide, which includes both a search sequence and charts for each object. On the other hand, I used a free star map to figure out my sequence and the Pocket Sky Atlas for actual finding. So you may be wondering if I used the Field Guide from the field at all. The answer is that frankly I didn’t use it that much. The Field Guide charts are great, especially for people who don’t have an all-sky atlas or who are looking for one-stop shopping for the Messiers. But from working on the AL Binocular Deep Sky and Urban Observing lists this spring I’ve gotten used to using the trio of (1) an observing list, (2) the PSA, and (3) a logbook for taking notes. I have used the Field Guide once or twice in the field, but I’m so used to the PSA now that it just feels more reflexive to reach for that instead. And I knew that on marathon night I needed to use what worked best for me. That said, I did use the Field Guide to find the one that I’d missed (M40), to double-check that I’d gotten everything in the Virgo-Coma clutter (even though I used the PSA for the actual slog), and to work out a couple of the twilight rush star-hops. The Field Guide was most important for giving me the inspiration and confidence to tackle a marathon in the first place, and I definitely wouldn’t have been without it by my side. It’s a great book and I recommend it to anyone with an interest in deep sky observing. 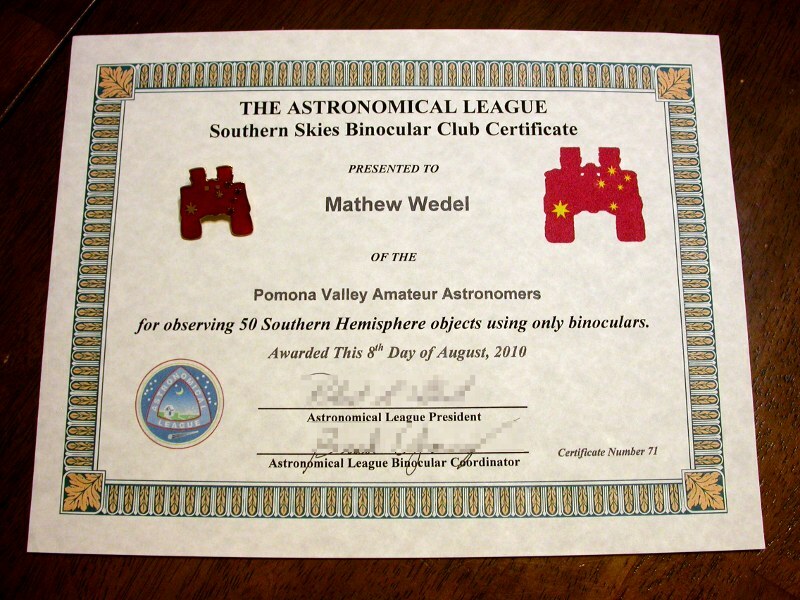 Since I moved to SoCal and joined the local astronomy clubs, I have done lots of public outreach events and moon and planet parties, but until this past weekend I had never been to a star party. Moon and planet parties are easy; set up your telescope wherever there are people and show them the bright stuff. Light pollution is no problem. Star parties are a different story. If you want to see the faint but beautiful clusters, nebulae, and galaxies, you have to have dark skies. Both of my local clubs have star parties regularly, but until now there has always been some scheduling conflict or another that kept me from going. But I finally had a shot last Saturday, January 9. The Pomona Valley Amateur Astronomers were going to the Salton Sea, a big saline lake out in the desert south of Joshua Tree. I spent last week planning the trip, making a pack list (which I need to post sometime), and especially figuring out an observing list. 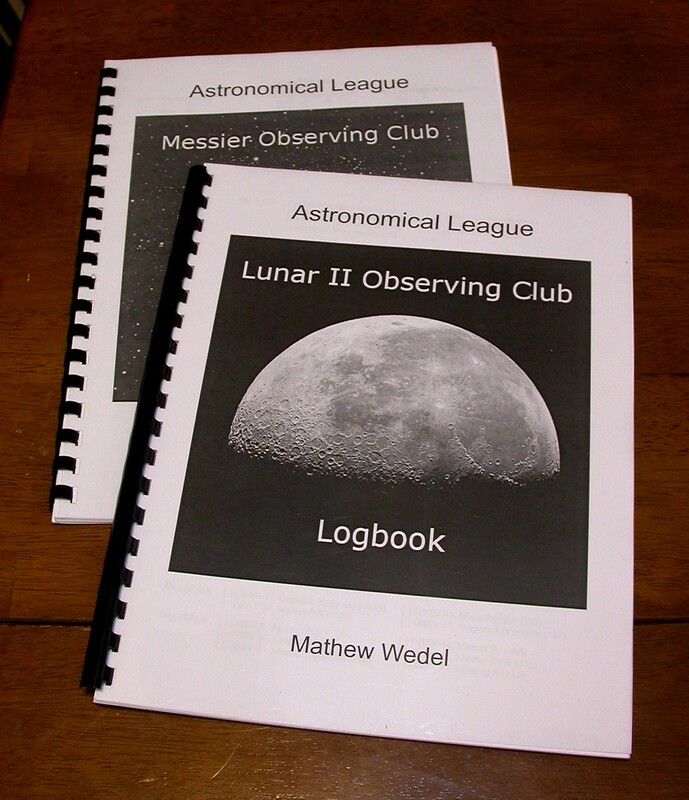 The AL Messier Club is my main observing goal this season, and I am freshly armed with Harvard Pennington’s extremely useful Year-Round Messier Marathon Field Guide, which has finder charts and eyepiece sketches for all 110 Messier objects. Inspired by Jay Reynolds Freeman, I decided to get as many Messiers as possible with my 15×70 binoculars; those observations would count for both the AL Binocular Messier Club and the regular Messier Club. About 20 or so Messiers are currently too close to the Sun to be observed right now, leaving about 90 viable targets. Knowing how unpredictable observing can be, I decided that my conservative goal would be 20. But I secretly hoped to bag quite a few more, maybe 50 or beyond, which didn’t seem unreasonable if I could just stay up all night. We had some nice clear nights last week, and I was sorely tempted to stay up observing from my yard on a couple of evenings, but I decided to save my energy for the big push Saturday night. Saturday I got up early, got packed, took care of some household chores, at lunch, and tried to get a short nap before I hit the road. I was too keyed up to sleep, but I at least chilled out a bit. I got on the road at 2:00 so I could get to the State Recreation Area campground, where we were meeting, in time to set up before sunset. I was uneasy on the drive out. The sky was full of cotton, from horizon to horizon. Not low, scudding clouds, but the high cirrus-like stuff. Low clouds I don’t worry about so much; they come and go so fast that it is almost impossible to predict what is going to happen in 20 minutes or 20 miles away. They also tend to have breaks now and then so you can still get some observing done through the sucker holes. High clouds tend to stick, and the spaces between them are usually filled with enough haze to make observing difficult or impossible. As far as I could see, all of SoCal was under a vast tent of high clouds. A couple of times I almost turned back, but as Timothy Ferris said of observing in Seeing in the Dark, you can’t catch any fish if you don’t get your line wet. And who knows, sometimes things do clear off. I got to the campground and found a handful of other PVAA members setting up. Someone had talked to the park ranger, who said that daytime clouds often cleared off after dark. I set up my gear, scarfed a quick supper, and spent about half an hour watching birds. The Salton Sea is a major mecca for shorebirds and birders alike. There were dozens of night herons and a handful of great horned owls nesting in the trees near our campsite, and down at the shore I saw egrets, pelicans, about a trillion gulls, and little shorebirds of more makes and models than I can identify. Sunset was gorgeous, flaming pink clouds behind purple mountains, all reflecting off the glassy surface of the sea, interrupted only by the wheeling and gliding of hundreds of birds. But enough of that rot! What about the stars? Well, against all odds, they started coming out. First Jupiter, then Deneb in the northwest, then Capella, Betelgeuse, and Procyon in the west, and so on until all of the seasonal constellations were out. The sky wasn’t perfect–there was a thin high haze that dropped the transparency a bit, and the odd plank of cloud interrupted one or another view from time to time–but in general they were pretty darned good. Looking straight up, I could see the Milky Way easily and the Andromeda galaxy with averted vision, which is my usual test for decently dark skies. I made a couple of sketches for the AL Galileo Club and then started knocking off Messiers. It was a doomed enterprise. The first few were easy, and I took the opportunity to look at a few showpiece objects through other people’s scopes, and show off stuff in mine, but the longer I hunted, the fewer things there were to see. The clouds were creeping back in. Soon the entire western half of the sky was blocked off. Orion was still prominent, but the haze gradually increased until every star looked like a nebula. We pulled our chairs into a circle and had a good chat, but by 9:00 it was clear that the sky wasn’t getting any better, and according to the weather forecast, it wasn’t going to get any better. We reluctantly packed it in. I had come prepared to spend the night, but I expected to spend it observing. With nothing to hold me there, I hit the road back to Claremont. It was not a fun drive back. I’d gotten a measly eight Messiers with binoculars, and one more with my 6″ reflector. That was M29, which was pretty far down into the light dome over LA. And speaking of the LA light dome, for the whole drive back I was under it, the evil pink glow of urban sprawl bouncing off a solid deck of cursed clouds. And curse them I did, vigorously and continuously. I was holding out a secret hope. Sometimes Claremont is totally socked in, but up on Mount Baldy, less than 15 miles from my house, it’s totally clear. I had already planned to stay up all night and I had all my gear, so why not? I’d run up Mount Baldy and just see. I figured it would be completely either/or. Either the clouds would be high enough to go over the mountains, in which case I’d get nothing, or the clouds would stop on the flanks of the mountains, in which case they’d be blocking the city lights and the mountain would be even darker than usual. Of course, it was the former. Doubly defeated, I drove home. Got in after midnight, stowed about half my gear, and got ready for bed. I was just about to hit the sack when it occurred to me to wonder if I’d locked the car. I’m forgetful, and sometimes don’t, especially if it’s taken me several trips to unload. So I padded out to the driveway to check. The car was locked after all. More importantly, the sky was almost completely clear. In the 20 minutes it had taken me to unload and shut down, the edge of the cloud deck had come east and cleared my neighborhood. There was Orion, Taurus, Canis Major! Now, I had just rocked through the open clusters of the Big Dog a few nights ago with my reflector, and I knew they’d be easy prey for with the 15×70 binoculars, and I was up anyway, and I needed a win. So I pulled on some sweats, grabbed binoculars, atlas, logbook, and red flashlight, set up a folding chair in the middle of the driveway and got to work. I quickly knocked off the Pleiades, M45, which would have been an easy catch at the Salton Sea but which I’d passed over in favor of harder targets. I ‘d figured I could pick it up later, any time the sky was clear. There on the driveway at one in the morning turned out to be just the “later” I needed. Then M41, a bright and easy cluster in the heart of Canis Major. Then M44 and M67 in Cancer, and I was off and running. I didn’t find everything I looked for. The clouds were gone but the normal LA light pollution was still there. The effect of magnification is to spread out the background sky, thus making it darker, so to some extent you can fight light pollution with magnification. This works well with open and globular clusters, which are balls of stars in and around the Milky Way. It doesn’t work as well with nebulae and galaxies–magnification can actually hurt, by spreading out their otherwise concentrated light until it’s lost in the skyglow. And increasing the magnification is not an option with standard binoculars. I bagged every cluster I tried for–which is every one that was up at that hour–but failed to get even a single galaxy. I think that will require another trip up the mountain. Still, in a little over an hour, I’d bagged a dozen Messiers with the binoculars, including a couple, M40 and M48, that I’d never observed with any instrument. That brought me up to 20 for the evening with binoculars, and 21 total, just past my original goal for the star party. I stayed up a little longer to get M5–big, bright and easy–and even longer for M68, which was devilishly difficult in the LA light pollution, but ultimately doable, and called it a night. I’ll post directions for finding most of these, along with some tips and tricks for observing them from the city. The biggest hurdle is just getting out and trying. In the end, I had a great night and a lot of fun. I enjoyed the company of my fellow astronomers at the Salton Sea, and it was nice to go to bed, finally, full of victory energy and not just hatred for the clouds. 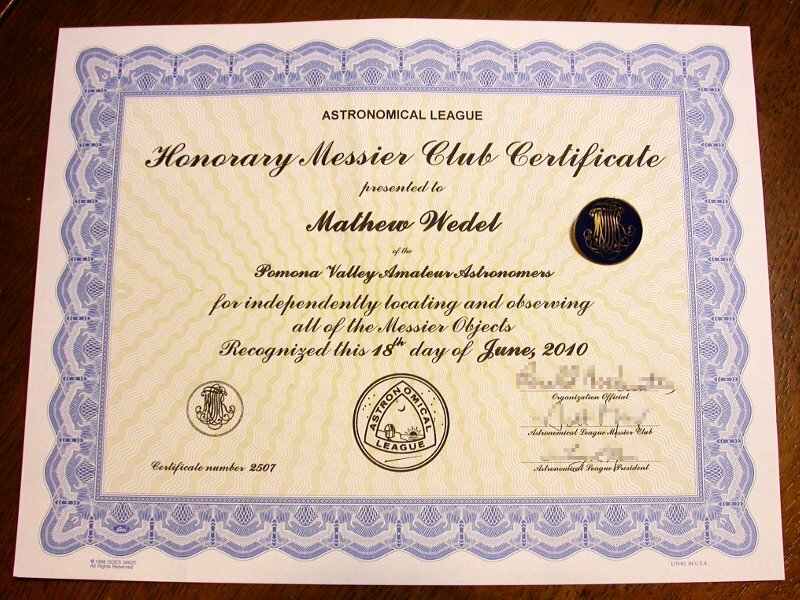 You are currently browsing the archives for the AL Messier Club category.